Color postcard marked: "Line up of planes. 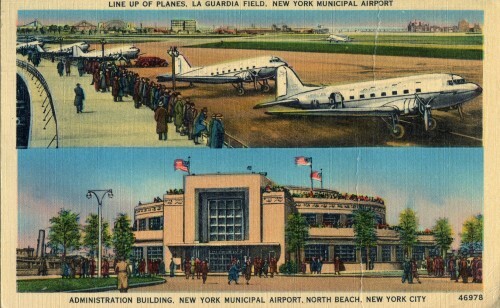 La Guardia Field, New York Municipal Airport". Manhattan Municiple Postcard Publishing Co Inc. Message on back. Postmark: NEW YORK, N.Y. JUN 1 1100PM 1941. 1 cent "For Defense" stamp.